This iconic quote is part of the legendary “I have a dream” speech that the well known human rights activist Martin Luther King delivered on August 28, 1963 at Washington DC. It is also when that great man gets killed on the 4th April 1968, that shocked and subsequently inspired a young teacher named Jane Elliot, from a small and mainly inhabited with Anglo-Saxon population town of Riceville (Iowa), to act against the atrocities of the then widely spread discrimination and segregation of black people. Her incredibly provocative, but proved to be very successful, teaching experiment stirred up a powerful reaction in American society, after a movie about it – “The eye of the storm” was released. Following it a movie about the movie with more “behind the scenes” details of the experiment was also released called “Class divided”. 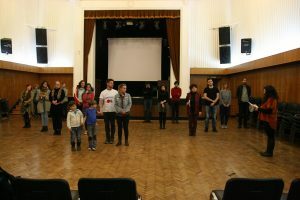 On the 19th of February 2019 more than 20 people gathered in the beautiful theater hall of the Federation of Scientific and Technical Unions in Sofia, Bulgaria to watch the projection of “Class divided”. Discussions and a thematic role-playing game that put participants into different character’s shoes followed. The aim of the game was to understand inequality and how difficult it is for some people to move forward in life because of their social status and ultimately, it teaches participants about empathy. The event was organized by the Society for Democratic Education and the PETRI-Sofia and IFYD volunteers joined for the purpose of organizing an interactive workshop and discussion after the movie. 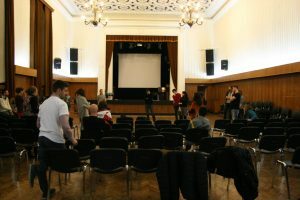 The event was part of the second edition of the “(Im)Possible Education cinema festival”. The people who came were students, philosophers, teachers and pedagogues, or simply people who are concerned with the topic of discrimination. The guests unanimously expressed their appreciation for Jane Elliot’s efforts to teach kids to accept, instead of hate. But what did Jane Elliot actually do in her experiment? Well, let’s dive into it – it is pretty interesting. As a teacher of third graders, she undertook a unique experiment with her class, that she hoped would make them understand how wrong it is to discriminate based on skin color, ethnicity, race… or even eye color. Things that are integral to our identity, but are not defining our personality and are not a result of one’s personal choice. Her classroom consisted only of white children who at that point, were taught by their families to hate and discriminate black people. She decided to divide the kids by the color of their eyes and much like society did at that time (and unfortunately still does sometimes and at some places), she would treat one of the groups as privileged and superior, and the other one as if it’s members are untrustworthy and inferior – all based solely on their eye color. The first day the blue-eyed kids are the superior group – she gives them a longer break, she praises them and speaks against the brown-eyed kids, while also making the brown-eyed ones wear a small collar on their neck so that “they are being spotted from far away”. The next day the roles are turned around. She even gives tests to the two groups to asses if their performance changes, when they are being regarded as privileged and when they are treated as inferior. In the end she gathers the class and asks them to share their feelings. When being the privileged ones, kids learned to feel superior rather quickly and scored higher on tests, but when they are forced to walk in the shoes of the marginalized group, they feel terrible and also score lower when being examined. The discovery was subsequently confirmed by Stanford University. Teacher Jane Eliot turns the classroom into a place where real life is happening – it creates real conditions for children to experience what is discrimination and to be touched by questions like what it’s like to be humiliated just because you’re different. What is the feeling of being a second-hand person? In this rather provocative experiment, it is impressive to see how only minutes can turn otherwise polite, attentive and compassionate children into cruel, discriminatory beings. The resolute teacher does the same experiment in different formats outside the school environment and the impact on people is remarkable every time. Ninety-eight percent of the population in Riceville is of white people of Anglo-Saxon origin, but nevertheless in the prison population over twenty percent are from minorities. To make sure prison officers are sensitive to the concerns of this large minority, the Iowa administration hires Jane Eliot to give her lesson to some of them and it works like a charm – adult prison guards learn a lesson of empathy and compassion. On 1st of March Bulgarians celebrate the arrival of spring and give away traditional bracelets for health and prosperity – “martenitsas”. 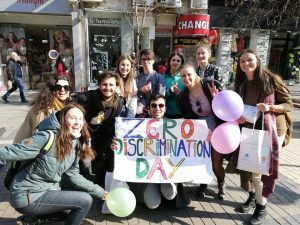 We at PETRI-Sofia know that this date is also important for another reason – it is the international Zero Discrimination Day. 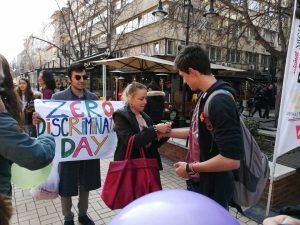 Our team decided to combine the two celebrations in an interesting way by giving away free martenitsas to people on the street, together with messages against discrimination. Remember that Martin Luther King quote from the beginning? It was one of the hundreds of quotes that we printed on little papers, made into tiny cute scrolls that we gave away to people of all kinds of ages and nationalities to promote tolerance. Our volunteers made the bracelets on their own which added value to them. 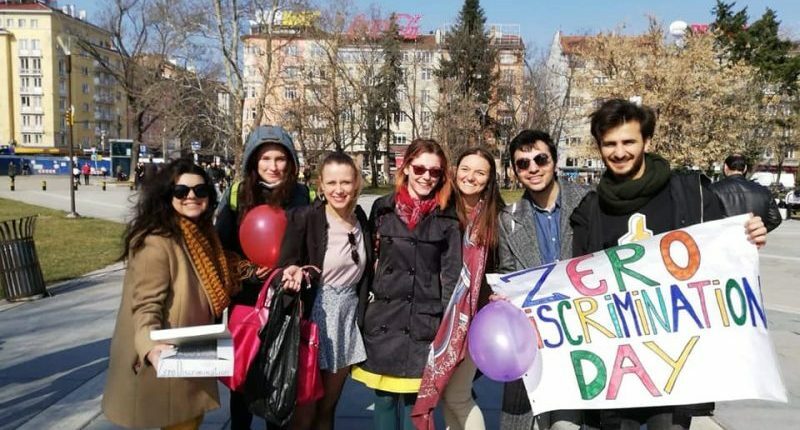 They also made a beautiful colorful poster with “Zero Discrimination Day” written on it and walked around the whole city center while giving away the martneitsas and messages so that they promote tolerance, acceptance and spread joy. As one of the main objectives of our organization PETRI-Sofia and IFYD is also to promote sexual and reproductive health, we distributed free condoms and special little boxes for keeping them safe. Talking about protection and sexual health is incredibly important, especially in a country like Bulgaria, where these topics are still a taboo for many people. This was proved by the reactions of some of the people when we offered them to take protection for free – a mixed reaction between shyness and disproving looks at us. It was especially important to talk to the youngsters– teenagers and adolescents who are just starting to explore their sexuality or regularly have sexual partners. We managed to give away more than 250 martenitsas, anti-discrimination messages and condoms. We provoked a lot of smiles and genuine support for our causes, so we consider this a successful event! But why are we posting about events from the 19thFebruary and 1stof March today? Well, today is the 12th of March and it’s no specific celebration, but it is a chance of silent reflection of all the significant dates that have passed. Four days ago was also the 8th of March – the International Day of Women! Happy Women’s Day, ladies, with a bit of a delay … but you know what? We don’t need a special day to celebrate the importance of women and to express concerns about the issues they face! Every day counts as important. Having in mind the difficulties women have faced trough history, and just how much more work there is to be done to prevent gender-based discrimination and violence, especially in some countries, Women’s day is a important commemorative day. It is significant for the Human Rights movement and activism in general, which fights to bring about tolerance and acceptance of people regardless of their nationality, race, gender, sexual orientation or any factors other than their personality and values. All days and activities that aim to fight against discrimination, hate speech and acts of hate are interconnected and this article is dedicated to all of them and to the notion that every day should be a day for reflecting on other people’s problems, a day of Zero discrimination and a day for appreciation – of women, men, black, white – everyone! But let’s talk a bit more about what are the most common women rights issues? Issues commonly associated with notions of women’s rights include the right to bodily integrity and autonomy, freedom from sexual violence, rights to hold public office, to vote, to enter into legal contracts, to have equal rights in family law, to work and be paid fair wages or equal pay, to have reproductive rights, to own property, to education. 1909 The first National Woman’s Day was observed in the United States on 28 February. The Socialist Party of America designated this day in honor of the 1908 garment workers’ strike in New York, where women protested against working conditions. 2015 In 2015, the UN adopted the 2030 Agenda for Sustainable Development and its 17 Sustainable Development Goals. Goal 5 is “Achieve gender equality and empower all women and girls”. Today there is still so much to be done: fighting for equal pay and equal opportunities to take part in politics; fighting for the right to have abortion which is still illegal in many countries; preventing atrocities like female genital mutilation, which is widespread in some countries where in general women are outspokenly treated as less of human beings – when families have girls it is considered to be “bad news”. One of the worst traditions that are highly discriminatory are the so called “menstruation huts”, that are known to be used in Nepal and aboriginal tribes in Australia because of menstrual taboos. They force women to spend the days of their period confined in shabby huts with poor ventilation, living conditions and sanitation. In the beginning of the year a woman and two children lost their lives in one such hut in Nepal, which focused Human Rights activists and society’s attention towards this not very well known problematic tradition. In conclusion, we at PETRI-Sofia and IFYD have the following message to all of you – whoever you are – respect and accept others! Life is hard enough – we all deserve to have the freedom to pursue happiness, but for this to happen we need to build a peaceful and tolerant human society and it starts with acceptance of our inevitable differences that actually make the world the colorful and interesting place it is.